For UMC this year marks 25 years that as Nevada’s only Level I trauma center. Clark County is home to a small group of super heroes, and it is a safe bet you can’t name one of them. They don’t wear capes or tights, yet they save people’s lives every day. Take like Andrew Linn. 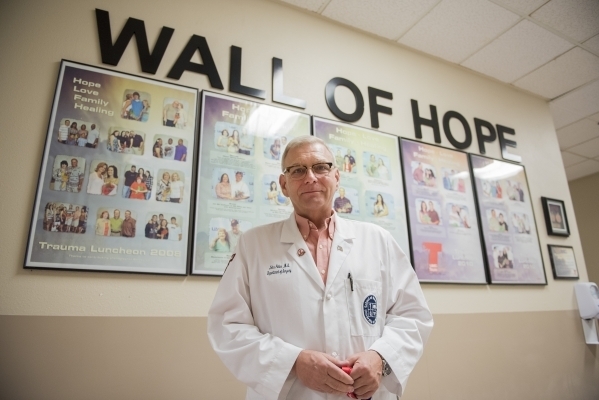 His X-ray is featured on the UMC Trauma Center’s Wall of Hope, which highlights pictures of people who had a 1 percent chance of survival when they arrived at the hospital trauma center. 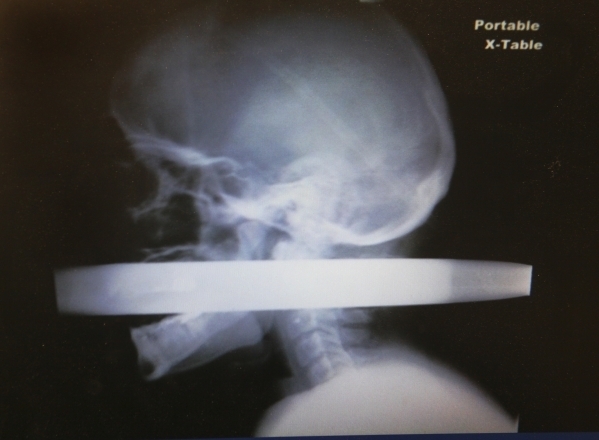 Linn was impaled on a fence post in 2011 and lived to tell the story. He and many others owe their lives to UMC, which this year is marking 25 years as Nevada’s only Level I trauma center. “We’re one of the best kept secrets in Las Vegas,” said John Fildes, medical director and chair of UMC department of trauma and burns. “People outside of Las Vegas seem to know more about this trauma center than people inside Las Vegas.” Whether Fildes is in Washington, D.C., the Centers for Disease Control in Atlanta, or the College of Surgeons in Chicago, “Everybody knows about the (UMC) trauma in Las Vegas,” he said. What is the difference between a trauma center and an emergency room? “Both of them will treat time-sensitive injuries and illnesses, but an emergency department will mainly treat asthma, heart attacks, strokes â things like that and see some injuries as well,” explained Fildes. “If someone has a life-threatening injury or a limb-threatening injury that could actually leave them disabled or kill them, they come to a trauma center,” he said. According to the CDC, if you are severely injured, getting care at a Level I trauma center can lower your risk of death by 25 percent. Nearly 45 million Americans mainly living in rural areasâ do not have access to a Level I or II trauma center within one hour of being injured. Fildes said that in 2006, two local hospitals, St. Rose and Sunrise, joined the trauma system. “There’s going to be many more to come,” he predicts. “We will see other hospitals try to become trauma centers, and that would really threaten what we’ve built here,” Fildes said. Experts back up his perspective. A 2005 study concluded that when too many trauma centers operate too close to one another, it can lead to inefficiencies, lower patient volumes per center and reduced quality of care. It can also cost consumers because hospitals pass on increased costs to insurers, who then pass on those costs in the form of higher premiums, deductibles, and co-pays to patients. “The more patients trauma surgeons take care of, the better they do in terms of treatment, but with too many trauma centers, you dilute that effect,” Ellen MacKensie, faculty chair of the world’s oldest school of public health, is quoted as saying on the Johns Hopkins Public Health website. According to the American College of Surgeons, to earn a Level I trauma center designation, the facility must be capable of providing total care in every aspect of injury from prevention through rehabilitation. A rigorous review is performed every three years to determine a trauma center’s commitment, readiness, resources, policies, patient care and performance improvement. Level I trauma centers must also meet the minimum requirement for annual volume of severely injured patients. Bad news, and good news, is that UMC meets that requirement. In 2014, the Trauma Center cared for 12,100 patients within its secure complex of 11 resuscitation beds, 18 ICU beds and three surgical suites. Patients are cared for by eight triple board-certified trauma surgeons, five intensivists, 41 emergency physicians, 18 pediatric emergency physicians, seven neurosurgeons, 17 orthopedic surgeons, 13 anesthesiologists, three surgical critical care fellows, two acute care fellows and approximately 69 specially trained registered nurses. In addition to providing clinical care, Level I facilities are required to perform research and follow-up studies to generate new knowledge and innovations in trauma care. “The thing that people don’t realize is there’s a research component which makes getting Level I so difficult,” said Donna Milner, former co-medical director of the emergency department of Children’s Hospital and Clinics of Minnesota. “You are guaranteeing X number of original publications coming from your facility from research, not just from one specialty area but multiple specialty areas that are only trauma,” she said. They must also teach the next generation of specialists. In July, 2008, Fildes successfully blended his roles as national chair of the American College of Surgeons Committee on Trauma, professor and vice chair of the surgery department at University of Nevada School of Medicine and his leadership at UMC to establish the nation’s first acute care surgery fellowship program. In another first and only category, UMC Trauma has partnered with the new Sustained Medical and Readiness Training (SMART) program piloted by Nellis Air Force Base. The program allows physicians, nurses and technicians from Nellis and Air Force bases across the nation to maintain combat readiness by treating injuries similar to those found on a battlefield such as knife and gunshot wounds. Last but not least, a Level I trauma center must provide community leadership in trauma prevention and public education. UMC participates in programs to prevent drinking and driving, pedestrian and bike safety and training for emergency medical service (EMS) providers.